This is also the first and best step in order to increase battery life of your Laptop (only for laptops with Nvidia Graphic card and Ubuntu 12.04 or later, you may try for other linux distros ). This post will teach you how to disable discrete graphics at every startup automatically (without any crashes and freezes). But first i have some facts about this phenomenon here, if you're not interested in facts just move to the "Solution" section at the bottom of post. When we use any Linux distribution, we observe that the battery gets consumed very fast. But is this the case with Linux only ? NO, WINDOWS ALSO BEHAVES THE SAME UNLESS the dedicated graphics driver is installed. You can verify it by installing the intel integrated graphics driver only and not installing dedicated graphics driver. Your fan will run fast and battery backup will be very low. It all happens because we do not install the dedicated graphics driver and both graphic cards (intedgrated and dedicated) remain turned on , thus consuming more battery (as if you're playing a high end game). Solution will be to turn off the discrete graphics card at every startup of linux. For windows users its simple (just install the Nvidia graphics driver from the official website). But on Linux its complicated. I noted down some readings showing battery percentage left vs. battery backup time in various situations. These results are what we need but this is not safe way to get it done, it causes freezes and crashes. So , we have to move on to nvidia optimus technology (but only for windows). This technology is included in the drivers intself, and that is why you don't face the problem while using windows with these drivers. Also i advice that never edit your /etc/rc.local file , It definitely causes crashes one day or another. Now the question is how to achieve the above Nvidia-optimus technology on linux ? What is the correct way to install Bumblebee ? This solution is for Ubuntu 12.04 onwards. However Ubuntu 13.10 officially supports Bumblebee. If on 12.04.3, replace linux-headers-generic with linux-headers-generic-lts-raring. Enable the Universe and Multiverse repositories (for bumblebee and nvidia packages respectively). 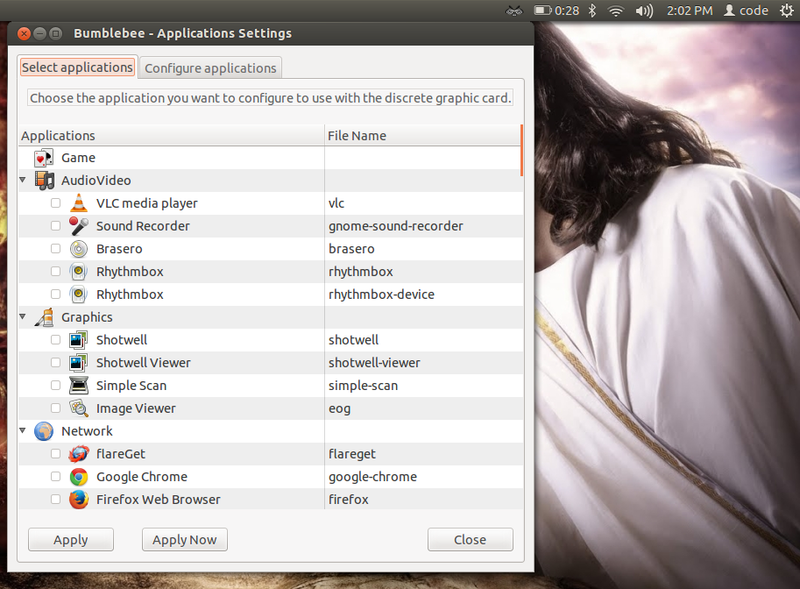 This will by default run all applications with integrated graphic card, thus saving your battery by keeping discrete graphics card turned off.You can Select any app(game) to run on discrete graphic card easily.You can read and learn more about the usage of Bumblebee at Ubuntu Wiki. Click "Download zip" at the right end of page. Extract the zip file in home directory. Its done , now you can run it by opening the dash and searching for "bumblebee applications settings" and "Bumblebee-indicator". Type "startup applications" and press enter. Enter any name you would like. In Command , click browse and select the file "/usr/share/bumblebee-ui/Bumblebee-Indicator.py". Update : Ubuntu 14.04 users can install Bumblebee with help of this post. May Also work with : Ubuntu 12.04 and later versions, any laptop with NVIDIA graphics card.